In the face of the worst flooding event in Houston’s history, countless social media rumors have appeared regarding House Bill 1774, a new law in Texas will take effect on September 1, 2017. While HB 1774 shifts the balance of power toward the insurance companies and weakens the rights of individuals, many of the rumors swirling around on social media are simply not true. Although HB 1774 amends the law to make it more difficult to bring insurance claim-related lawsuits, the claims process will remain mostly unaffected. Most homeowners’ insurance policies do not cover flooding-related damages. It is always important to read and understand your homeowners’ insurance policy. 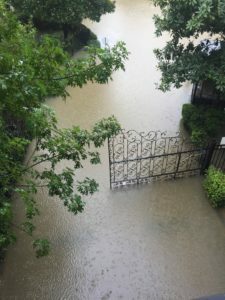 In Texas, most homeowners’ policies do not cover flood-related damages. When they do, the policies are often through the National Flood Insurance Program and the Federal Emergency Management Agency (FEMA). These national entities are not subject to the laws of the State of Texas, including HB 1774. It is very likely that HB 1774 does not apply to your flood-related homeowners’ claim. However, HB 1774 likely will apply to other property damage claims, including damage to your motor vehicle. HB 1774 is primarily aimed at the procedure for bringing lawsuits related to insurance claims—not the claims process. HB 1774 does not change the process for filing an insurance claim in Texas. You will be able to document and file insurance claims for property damage caused by Harvey after the storm has passed and it is safe to do so. If your property is covered by an insurance policy for storm-related damages, your insurer must work with you in good faith to pay on your claim. Please do not risk your safety to document property damage during the storm. Your property is not worth your life. Even if you file a claim before September 1, 2017, most of HB 1774’s provisions will likely apply to your claim. Because the provisions of HB 1774 mainly deal with insurance-related lawsuits (not claims), the only way to preserve your rights under the old law is to file a lawsuit alleging wrongful denial, underpayment, or delay in payment of your insurance claim before September 1, 2017. Because your insurer will not have made any decisions with respect to your Harvey-related insurance claim before September 1, 2017, most of the provisions of HB 1774 related to the filing of a lawsuit will apply to your claim even if it is filed before September 1. Specifically, the new law contains a 60-day notice period before you can file a lawsuit against your insurance company for wrongful denial, underpayment, or delay in payment of your property claim. See Tex. Ins. Code § 542A.003(a)-(c) (effective Sept. 1, 2017). However, it is important to keep in mind that failure to comply with the notice provision will result in dismissal without prejudice (meaning you can bring your lawsuit again), and that the notice provision may be waived if giving notice is impracticable because, for example, the statute of limitations may run before the end of 60 days. See Tex. Ins. Code § 542A.003(d)-(e) (effective Sept. 1, 2017). But if you file a claim before September 1, 2017, a liable insurer may be required to pay more damages because of wrongful denial, underpayment, or delay. As discussed above, most of HB 1774’s provisions are likely to apply to your insurance claim-related lawsuit, even if you file your claim before September 1, 2017. However, for claims filed before September 1, 2017, your insurer may be liable to you, in addition to the amount of the claim, for interest on the amount of the claim at a rate of 18 percent per year as damages under the old law, if your insurer is ultimately found liable for wrongful denial, underpayment, or delay in payment of your insurance claim. By contrast, under the new law, an insurer would be liable for simple interest on the amount of the insurance claim at a floating interest rate of 10 to 20 percent (5 percent plus the applicable interest rate under Section 304.003(c) of the Texas Finance Code). Tex. Ins. Code § 542.060(c) (effective Sept. 1, 2017). The prospect of paying additional interest damages at an 18 percent rate (rather than a 10 percent rate) may have a greater deterrent effect on an insurer thinking of wrongfully denying, underpaying, or delaying your claim. But, again, it is not worth risking your safety to attempt to document property damage during the storm. If, however, you are able to do so safely, filing your claim in writing before Friday, September 1, 2017, may allow a greater damages recovery if your insurer wrongfully denies, underpays, or delays payment on your claim. In Texas, insurance companies have a duty to fairly and promptly handle your property damage claim. It is important to keep in mind that in Texas—regardless of the new law—insurance companies owe their insureds a duty of good faith and fair dealing under the common law and under the Texas Insurance Code because of the “special relationship” between the insurer and insured. See Viles v. Security National Insurance Co., 788 S.W.2d 566, 567 (Tex. 1990). Insurers that breach this duty of good faith may be held liable for triple the amount of your actual damages, attorneys’ fees, interest, and costs of court. As rumors continue to swirl around on social media, please remember that (while the information on this page is not and should not be considered legal advice) there is no substitute for the advice of a knowledgeable attorney who has studied the law and knows what it does and does not do. If you would like to get into contact with our firm, please do so using the space provided on this page. Tropical Storm Harvey has hit our city hard, and it’s not over yet. Even as we write this, we’re watching the rain continue to batter Houston. Wherever you are, we hope that you are safe and indoors. Please stay off the roads, if possible. Document and make insurance claims as soon as possible, but do not risk your life in the process.